We are well and truly into summer now, well a British summer anyway, come on sun make more of an appearance please! This month’s Birchbox theme is sun, sea & sand - so I’m expecting a summer theme with the products. I received two full size products and three very good size samples. Continue reading to see what products I received. Lavender is one of those scents that’s just not for me, so even though the body butter itself feels lovely and moisturising on the skin, I think this is one I may pass onto my mum. I’m only just staring to venture into the world of eye creams, it’s like a switch has turned on where I am now suddenly very aware that I want to take good care of my skin and avoid fine lines and wrinkles for as long as I can! 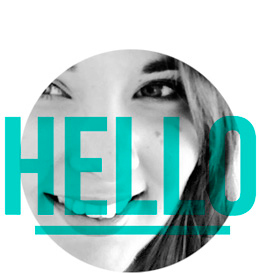 I’m familiar with the Balance me products, have many samples that I’ve tested out. I like the feel of this product, it feels lightweight and nourishing and if it works I can see myself repurchasing. I was so excited about this product, I’d seen people’s unboxing videos and posts and see that this would be coming in my Birchbox. I loved the look of the coral shade and knew it’d be perfect for summer! BUT I’d seen a few people receive the purple shade, something I really didn’t want as I’m not into darker colours on lips. Guess what? I received the purple shade, menatour. Massively disappointed, I know it’s all luck but when it comes to beauty boxes I seem to have the lipstick fairies against me. The formula is lovely, its smooth and glides on effortless. 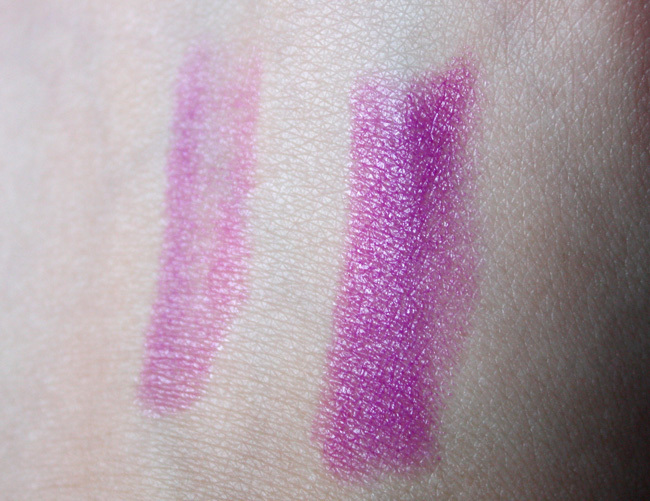 Even though they are called sheer lip lubes, it actually has quite a lot of colour payoff. The end result is a more pinky purple, maybe I can get away with it - I’m still not sure. This one seems to be a beauty box favourite! This is the second time this year that I’ve received this sample from Birchbox, which even though I love the product I still find it disappointing to find product samples repeated. The sample size of this is the best I’ve seen so far, it gives a decent amount of product to really give it a test run. Which considering I’ve heard of a few people having breakout issues with this product, so having enough sample for a few weeks is great as then you know if it’s just coincidence/hormones or the product itself. 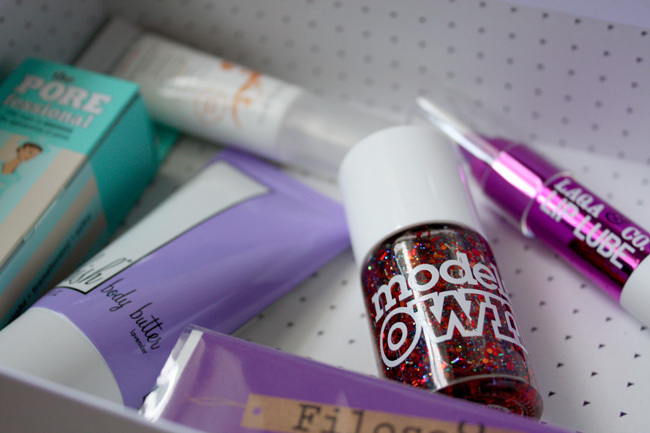 I did a mini review in the Birchbox I originally received it in, you can read it here. My models own nail collection is slowly growing and glitter polishes is something I lack in general. So this is a welcome edition to my nail varnish collection. 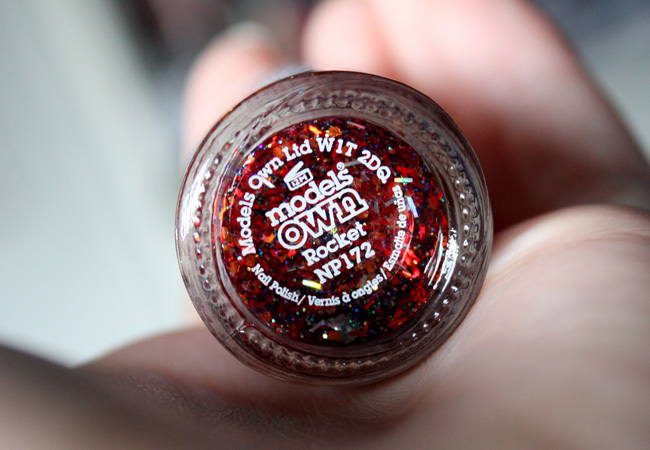 The shade I received is “Rocket” which is part of models own’s fireworks collection. 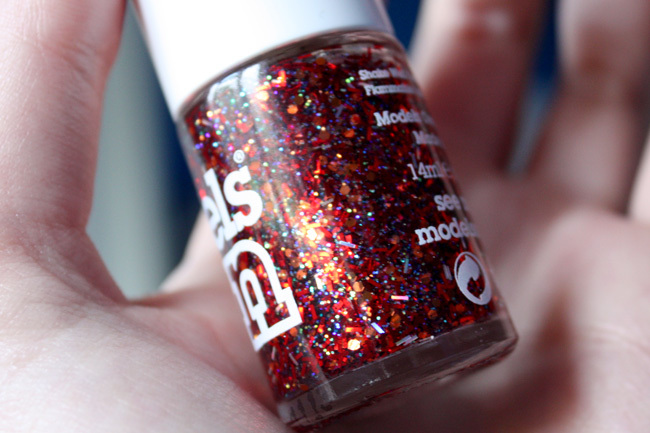 It’s a clear polish that’s packed full of colourful glitters all in varying shapes and sizes. It’s very buildable, so you can create different intensity of glitter finish as you desire. I love how it looks over white polish and baby pink, but most importantly I think this will be perfect for Christmas nails! I think I’m a bit torn between whether I am impressed with this box or not. It had a good selection of products but my favourite product would have been the lip lube if it were in a different shade and the fact I’ve received the same sample twice in the porefessional are what let it down for me. I wish there was an option to select your preference with lip colours, as I seem to always luck out with lipstick colours with birchbox. 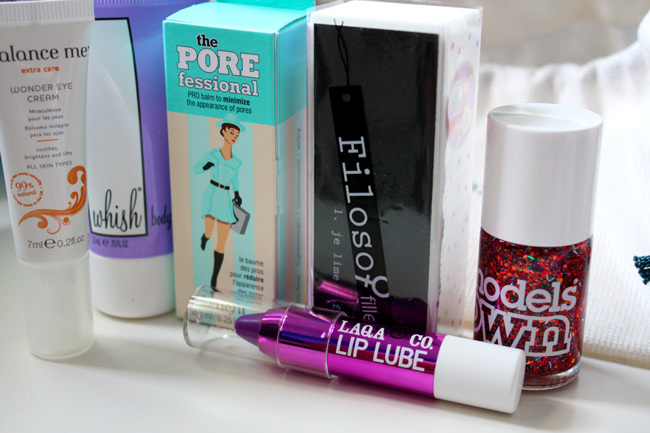 What did you receive in your Birchbox? Were you happy with it?